October 2011 Featherweight Prizefighter winner Choi Tseveenpurev takes his first steps towards capitalising on his Prizefighter fame when he fights Bastien Rozeaux this Friday. As you'll see soon, Rozeaux isn't world class, but it is important for Choi to just get himself out there. 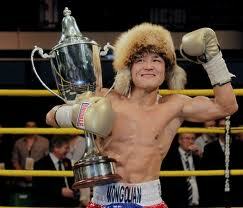 The Mongolian has been inactive since October and needs to fight. Rozeaux, 28, has spent most his career at super bantamweight and will take the step up to featherweight to fight Choi. This is a rise in competition for the Frenchman and frankly, I think he will be outclassed. Let's take a look at the stats. The only things I give Rozeaux are an age advantage and he's one inch taller. In all other areas he's lacking; Choi has more wins, has fought at a higher level and just has better skills. With his decent knockout record (65%) I think he can put Rozeaux on the floor and will do it with ease. The only chance you can give Rozeaux is a puncher's, and it is worth pointing out that the Frenchman goes into this fight having lost two in his last five. Now, you might be wondering where the fight poster and betting odds are. Simply put, good luck finding them. We tried and tried to no avail, and I even considered knocking up my own fight poster for it. Sorry about that. The fight is on at the Troxy in London, a venue that has had the likes of Morrissey and The Cribs grace the stage, and hosts a lot of MMA and boxing events. Tickets are £30/£50 and you can buy them here. Enjoy the fight.